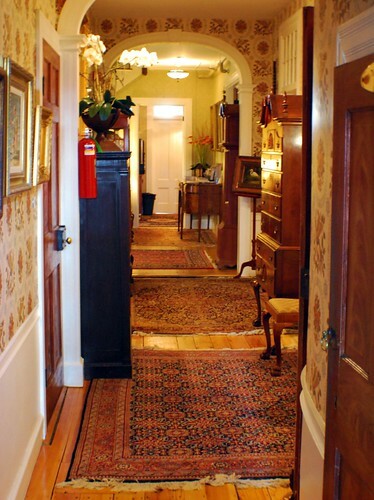 Having caught a glimpse of the beauty within the Captain Lord Mansion while checking in, I decided that it was finally time to leave the opulence of the Callender Room where I would be spending the night and head out with my Nikon to take some pictures of the rest of the house. 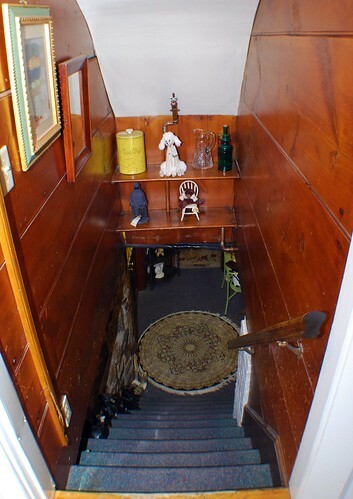 Even though what I really wanted to do was make use of the step-stool next to my bed and see if the bed was as comfortable as it looked I resisted the urge, opened the door, stepped out into the hallway, and then was faced with a decision. 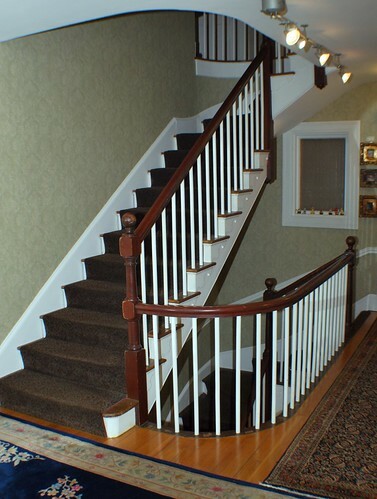 … go up the stairs to the third floor of the house and make my way back down? After debating it for a moment or two I opted for heading downstairs and working my way back up to the third floor before heading outside to check out the grounds. I suppose that in retrospect it might have made more sense to go the other way but when do I make sense? 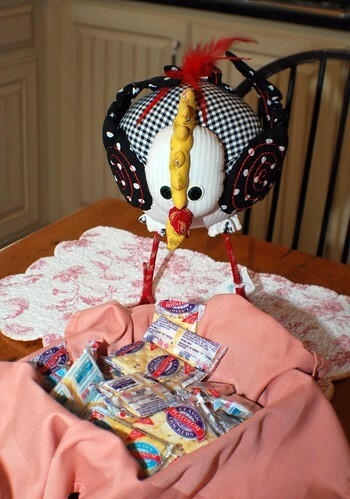 Besides, I knew that there were going to be afternoon refreshments in the kitchen (Donna told me so!) and I was starting to get a little bit hungry as that cookie I’d eaten when leaving Connecticut had long since worn off. 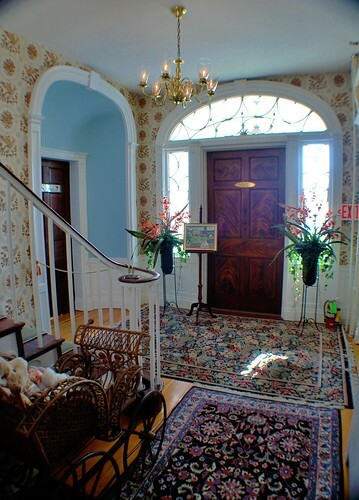 At the bottom of the stairs I hung a quick left and soon found myself in the bright and roomy kitchen of the Captain Lord Mansion where guests would be gathering in the morning for a three-course breakfast. For now it was empty but there were home-baked goodies and fresh fruit along with cheese and crackers on the far table as well as a crock-pot full of warm “Swedish glogg” sitting on the stove. The glogg – a non-alcoholic mulled cider and cranberry juice beverage – is a real favorite of guests at the mansion and served during the winter months. In warmer weather, the glogg is replaced by iced tea, iced coffee, and lemonade but I was told by reliable sources that even then guests still ask for the glogg. One taste was enough to understand why! Yummy! The stove that the glogg was sitting on was built around 1902 by the Morandi-Proctor Company of Boston and it had been moved from the original kitchen to the new one when it was renovated two years ago. Even though it’s no longer a functioning stove, it’s another favorite of guests and was given a place of honor in the new kitchen. 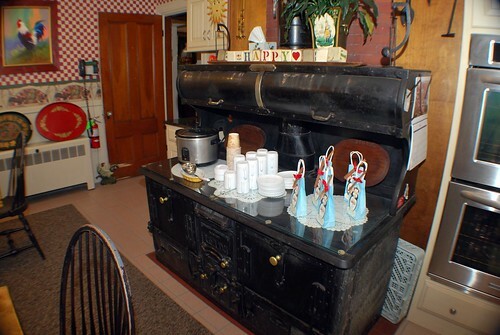 I’m sure that back in its day it was considered “the Cadillac of stoves” and any housewife or cook would have been darned proud to own one; even now it’s a pretty awesome centerpiece. 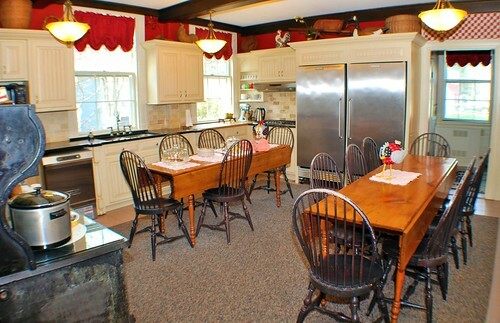 Even though it has been modernized with stainless steel refrigerators, double Dutch ovens, a dishwasher, microwave, and other new-fangled amenities, the kitchen is still a perfect fit for the mansion and I'd be willing to bet that if any of the original Lords were to see it, they'd be quite pleased. 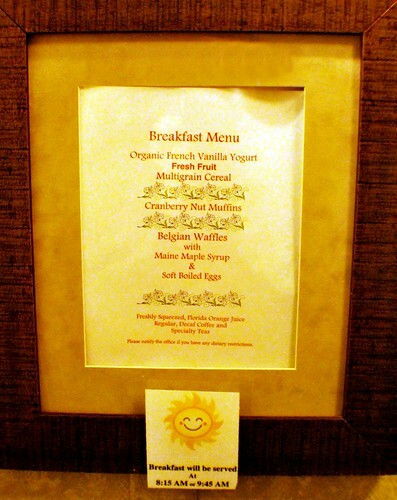 The whole feel of the room definitely had me looking forward to breakfast in the morning and that became especially more so when I saw the menu that was posted just outside of the kitchen listing what was going to be served up for breakfast the next day. 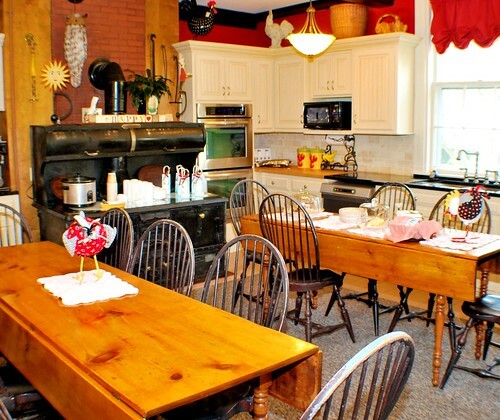 Breakfast for guests of the mansion is served in two seatings family-style in the country kitchen - once at 8:15 and again at 9:45. Not being much of an early-morning type I had chosen the 9:45 seating when asked earlier by Donna but after taking a really good look at the menu I was beginning to think I should have opted for the first seating as it all sounded delicious and I wasn’t sure I was going to want to wait that long. However, I was willing to work on that “patience is a virtue” thing just this once! 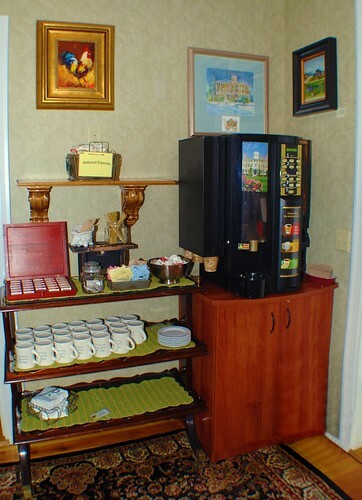 Right outside of the kitchen is a coffee & tea bar where at any time of day or night guests can help themselves to a bag of microwave popcorn or serve up a steaming cup of tea from a pretty good assortment of flavors. 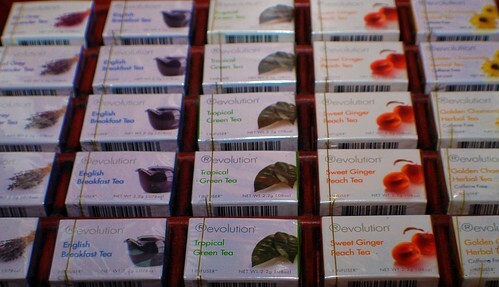 Aren’t these just the cutest little boxes of tea ever? I just loved these and the tea chest that they came in! 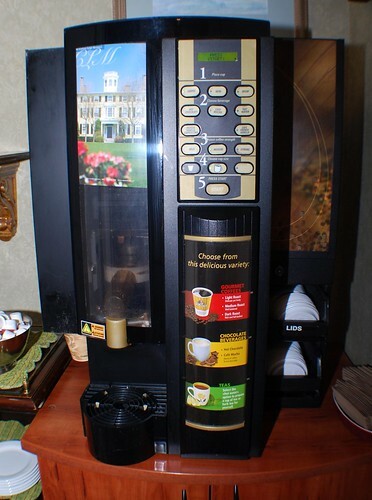 If tea just isn’t your cup of tea, then there's an awesome coffee machine that reminded me of the one I’d fallen in love with at the Hotel Brexton in Baltimore. Ah bliss! Coffee, cappuccino, hot chocolate – all at the touch of a button! Come to think of it, I hadn’t had a cup of coffee yet that day either so I made a mental note to stop by and grab a cup after I was done prowling around taking pictures. A French Vanilla Cappucino was sounding particularly tasty! From the coffee area I turned around and entered the Gathering Room just off of the main lobby. 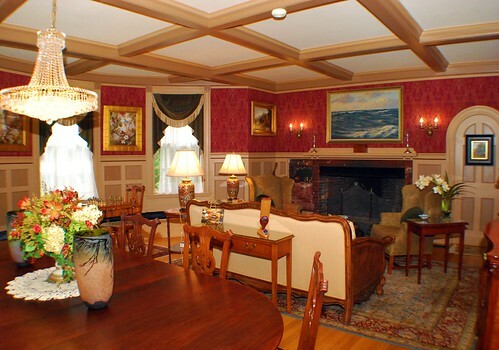 High-back wing chairs and a camel-back sofa are arranged in front of the mansion’s original 1812 cooking fireplace where guests can relax in front of a toasty gas-heated fire 10 months out of the year - just don’t book a stay in July or August if you want to experience the fireplace! On an ottoman in front of the fireplace, guests can also find lots of handy information like menus for area restaurants and directions to other places of interest. 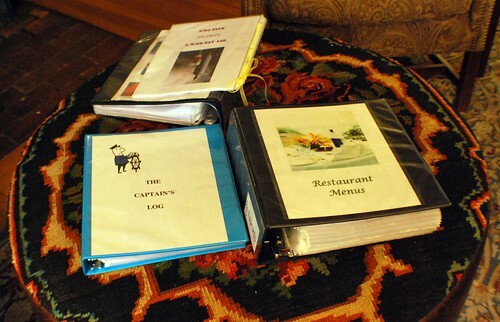 Donna told me that they do their best to keep the menus up-to-date and current and from the looks of the binder, there were plenty of places to choose from. Not that I went to any of them as I didn’t have the luxury of a lot of time but there’s always another trip, right? 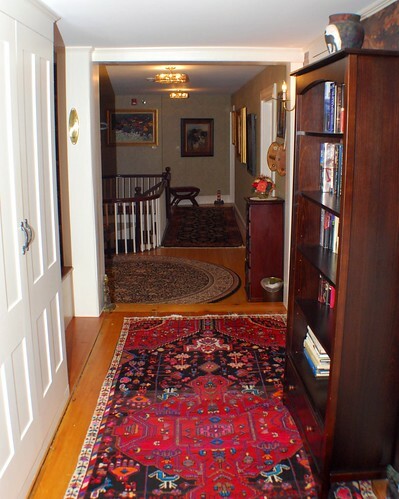 On the other side of the large room which is divided by two very large Oriental rugs, is the formal dining room where breakfast is served if there is an overflow of guests in the kitchen. 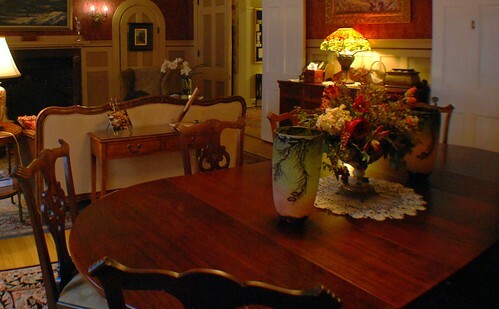 The table and chairs are "Centennial Chippendale" pieces and were owned by the original Lord family. 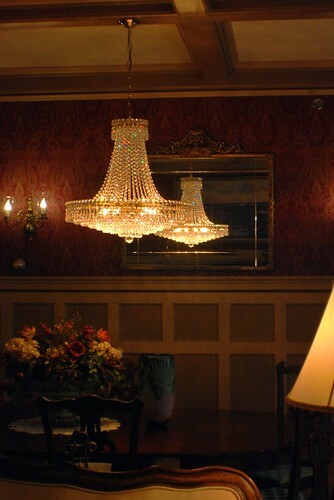 They are the only pieces of furniture, as well as one bed, that remain from the original furnishings along with the chandelier that hangs above it. As Donna told me, it's quite the piece to try to clean but it was most definitely gleaming and sparkling quite nicely from its place above the center of the table. 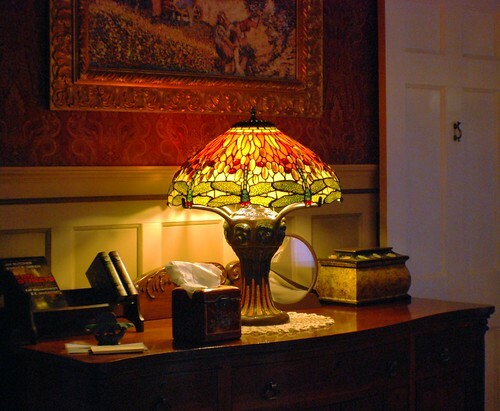 There's also a beautiful low-boy dresser with a gorgeous Tiffany lamp and other assorted "period" pieces in the Gathering Room. 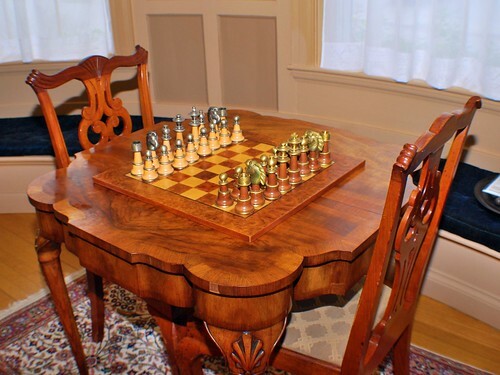 Also in the room is as a gleaming chess set that really made me wish I had someone to play a game with even though it's been years since I've sat down across from anyone at a chess board. Leaving the Gathering Room by way of the Dining Room end, I came across another low-boy in the main lobby that held a vast assortment of postcards and other informational brochures. 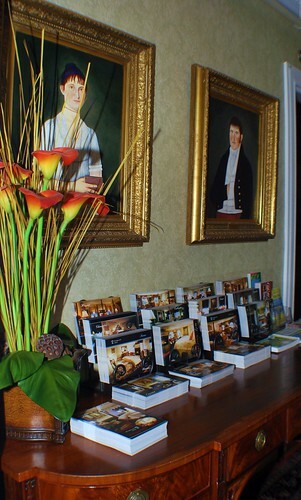 The postcards were all similar to the one that was on the mantel of the fireplace in my room in that each one showed a different room in the mansion along with several others that were pictures of the mansion from the outside. Hmm, let's see ... if I wanted to collect one from each room that I've stayed in at the mansion that means I'd have to go back fifteen more times and stay in fifteen different rooms. You know, I bet that could actually be a lot of fun and a task I really wouldn't mind undertaking at all! 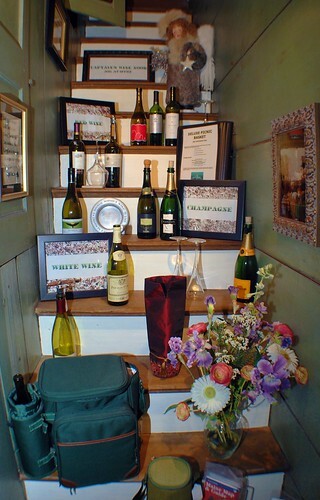 As I continued down the hallway of the first floor I came across a "wine closet" of sorts located just outside of the Reception Office. On display were a few of the wines and other assorted goodies that guests could order to enhance their stay at the mansion. It looked like the innkeepers had thought of everything from flowers to champagne to chocolate-covered strawberries to picnic hampers! I'm pretty sure that if they didn't already have it, if there was something you really wanted, the staff at the mansion would do their best to find it for you! Next up was a computer closet complete with a printer for guests to use if they weren't traveling with their own computer and found they were in need of printing boarding passes or anything else. 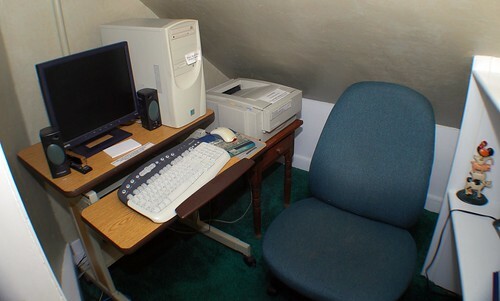 The small room that the computer set-up is located in used to be a sewing room for the convenience of guests if they found they had something to mend while they were there but obviously the mansion likes to keep up with the times and we do live in a very technologically-advanced age. 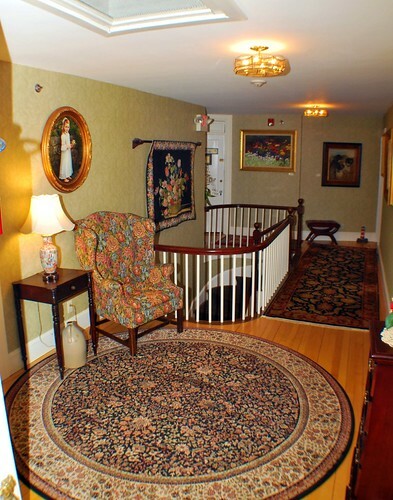 Just because you're staying in a house built in 1812 doesn't mean you don't want the amenities of almost 2012 so they are amply provided at the Captain Lord Mansion! 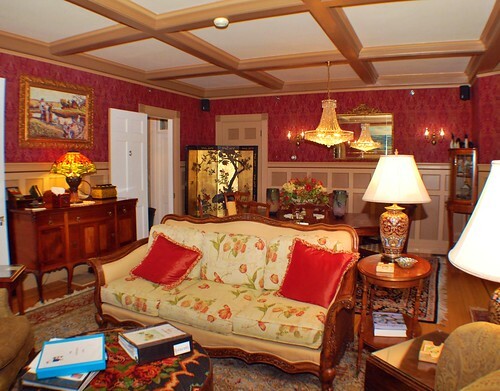 This is the main foyer of the house and the area in which two of the mansion's most luxurious rooms are located - the Merchant Suite and the Oriental. 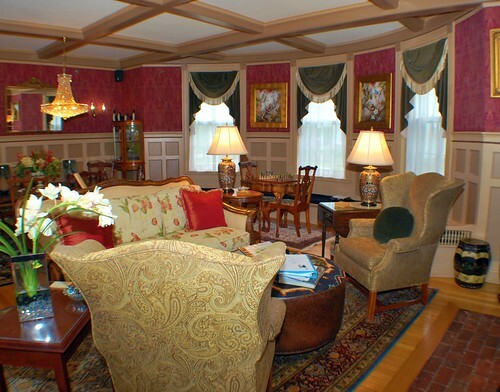 The Merchant Suite consists of three rooms and is the mansion's very best room; it's also the room that John and I were supposed to stay in on that trip we never made but I didn't dwell on that as I continued around the mansion. No sense crying over what was obviously his loss. 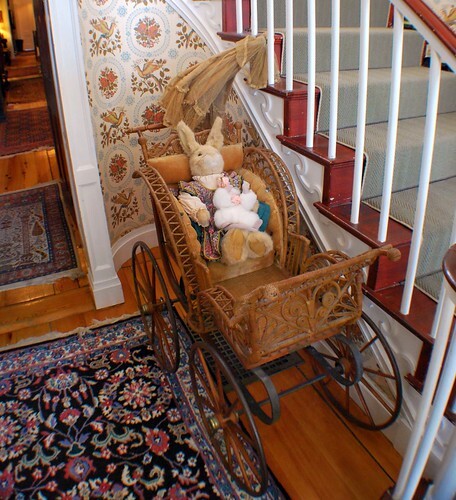 Replicas of antique toys lined the steps of the main stairway. 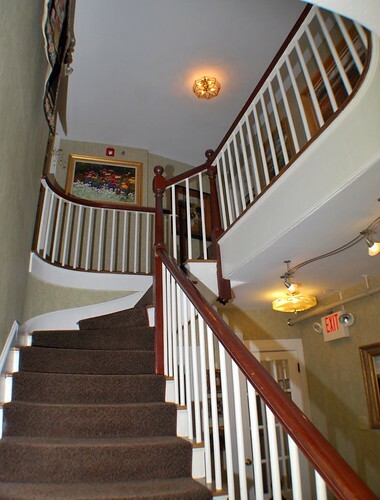 From the main entryway I turned and went back down the first floor hallway to the stairs that led down to the Garden Level where Donna had told me there was a gift shop that was filled with lovely items that guests could buy to take home with them. Wow was she ever right, too! If you click on this link and go over to Flickr, you can look at it enlarged and see some of the wonderful things that were offered for sale. If you were looking for unique Christmas gifts or one for any occasion it seems to me that you'd be able to find more than you needed right here! 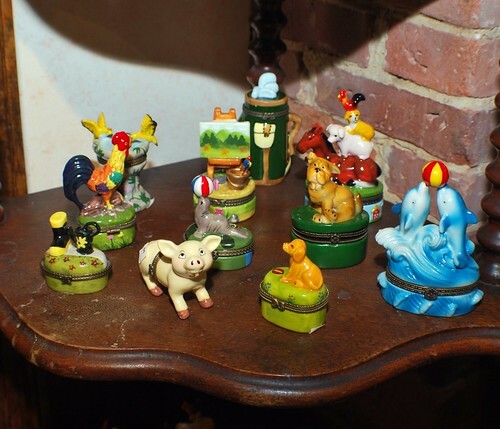 I thought these little pill boxes were exceptionally cute and I really regret not going back downstairs and buying a couple to use for gifts. Yep ... a return visit is most definitely going to have to be in order! In addition to the gift shop downstairs there's also a day spa as well as a second common room that used to be the summer kitchen of the mansion. 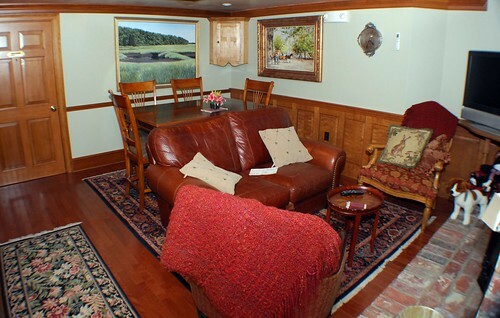 For those that would like to watch a TV larger than the ones in their rooms, guests can gather down here and also enjoy yet another wonderful fireplace at the same time. 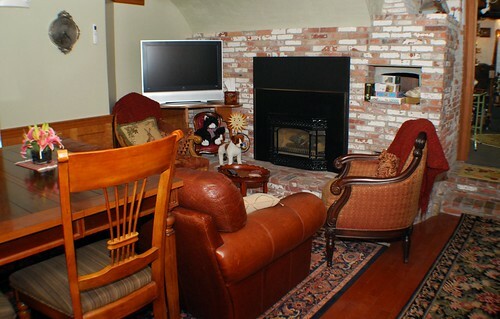 The fireplace and the brick oven are both original to the mansion. 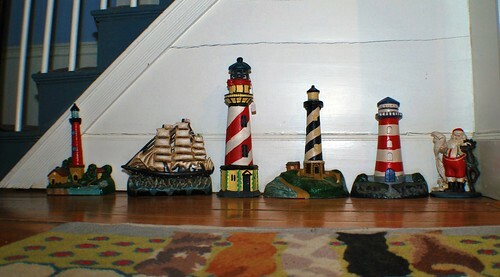 Coming back up the stairs from the gift shop, I spotted this display of lighthouse doorstops that I just had to take a picture of what with me being a bit of a lighthouse fanatic and all! I've got to say that several of them would look absolutely perfect in my house! Now I can understand how the ship got mixed in with the lighthouses but I'm not quite sure how Santa got into that line-up! 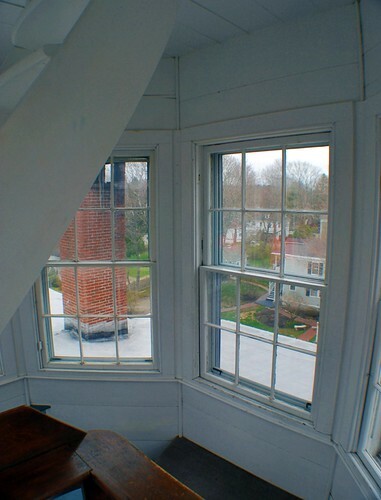 Having finished my tour of the downstairs section of the house, it was now time to take the spiral staircase up to the cupola located on the roof of the mansion. 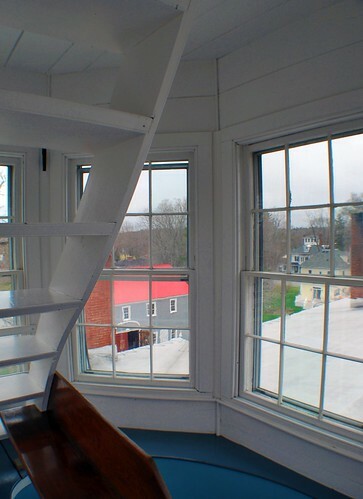 You can access the cupola from any floor - except the lowest level where the gift shop is located - and I've got to say that if you start from the first floor, it's quite the climb to get to the top! Good thing there was a bench up there as I really needed to sit down for a moment or two to catch my breath! 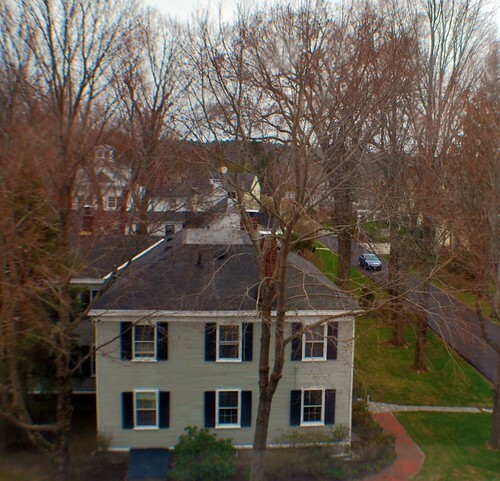 With the leaves still not quite out I was able to get a nice view of the surrounding neighborhood that is filled with other grand houses and could even catch a slight glimpse of the Kennebunk River. I suspect that once the leaves are out you get a lovely view of the leaves and that's about it but I would be willing to bet it would be more than worth the climb in the fall months! 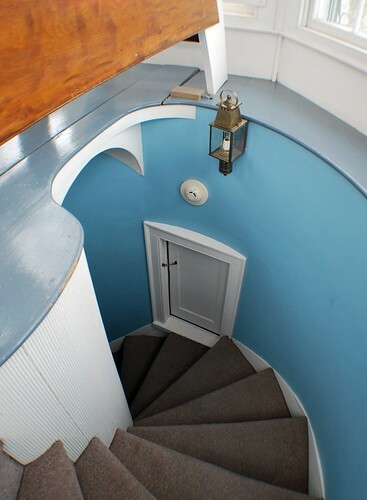 Leaving the cupola, I took the spiral staircase back down and exited onto the third floor where I was met with another hallway that was beautifully furnished. 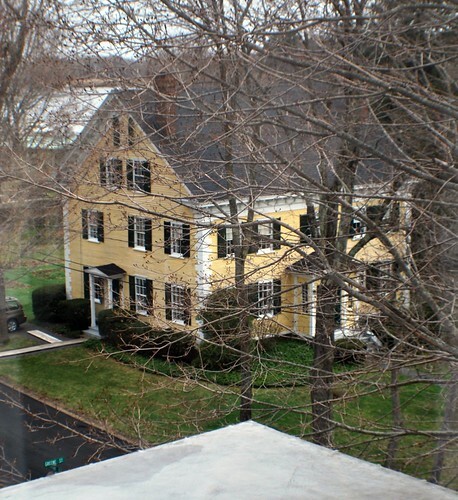 There are seven guest rooms located on the third floor, seven on the second floor, and two on the first - all of which look very inviting on the mansion's website. 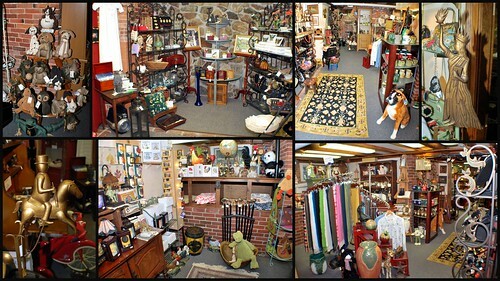 Each room is so uniquely decorated and offers so many different things that it would be really easy to want to try to stay in each one though in talking to other guests, they all seem to have their favorites that they like to come back to on repeat visits. I guess I can understand that but I can also understand itching to get in to see each and every room! I asked Rick what his favorite room in the mansion was and after giving it a little bit of thought he told me that the Champion was his favorite as it has the best bathroom in the house. As he described the Roman columns, the Italian fountain, and the air-jet tub big enough for two along with a walk-in shower I think I was beginning to understand why that would be his choice though I still think I'd like to check into the Merchant Suite one of these days! Oh heck, who am I kidding? I'd like to check into each and every room one of these days! I do hope you'll come back for the next and final installment of my trip to the marvelous Captain Lord Mansion. I could move right in there. Except that it is too big. And it is up nawth. Never mind. But this place is beautiful! Great photos, as usual. You make me wish I was up for a road trip. Wow! It's spectacular! If only I were wealthy and had people to manage a house like that! Well, that'll never happen, even if I were wealthy, but still. 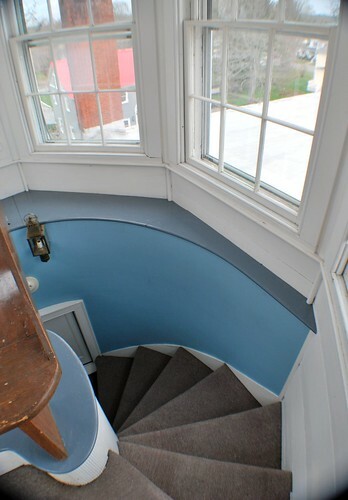 I was surprised to see the circular staircase as the outside of the house looks like your basic rectangle. Architects really use to do some wonderful things way back then. Now they're all your basic cracker jack boxes and built on the cheap. I went to their web site and looked at all the rooms. Magnificent! And I liked them on Facebook. 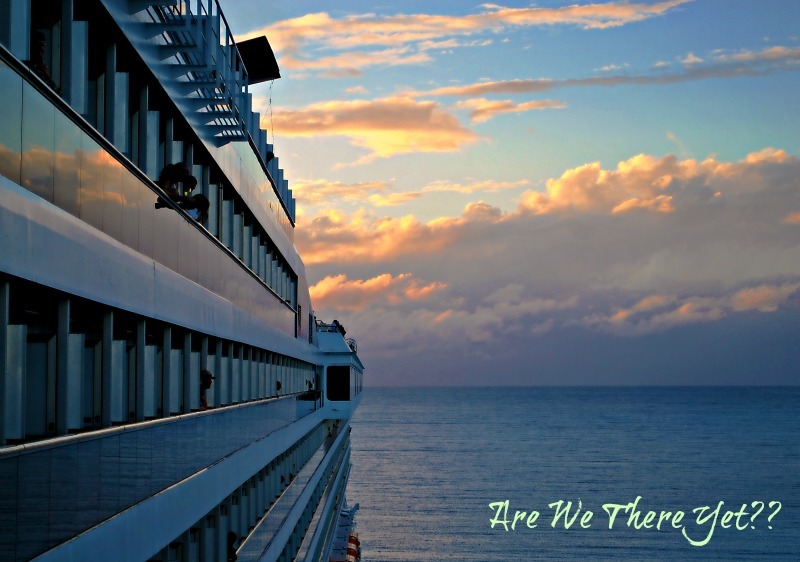 I would love to vacation there some day! I want to stay there! So glad you took the time and gave each part of the mansion a special review. 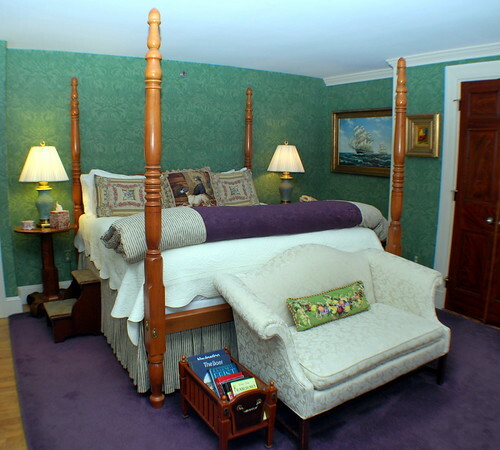 After seeing the bedroom I thought you would be hardpressed to leave it, but after seeing all the other little treats, I am picturing myself, with my skectchbook, mugs of coffee and that beautiful lounge. What a fun place to stay. It really has so very many things to offer. Excellent post too. Oh my it's just all so beautiful. The bathroom in the Champion room is magnificent! 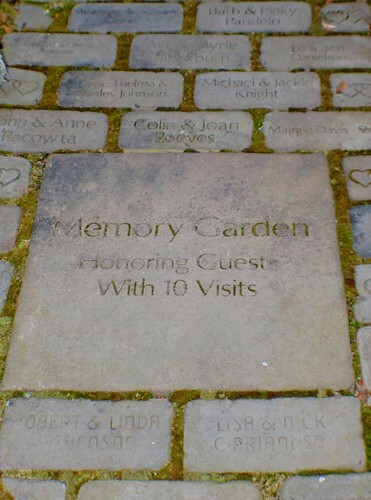 Will we see a brick with your name on it in the Memory Garden Linda? linda it is truly elegant. 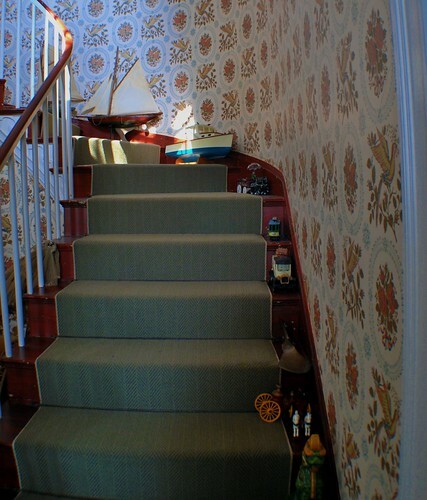 I love all of those beautiful carpets! I couldn't bear to say "rug." I checked out the room rates and must stay they're not as high as I figured. Very reasonably priced! 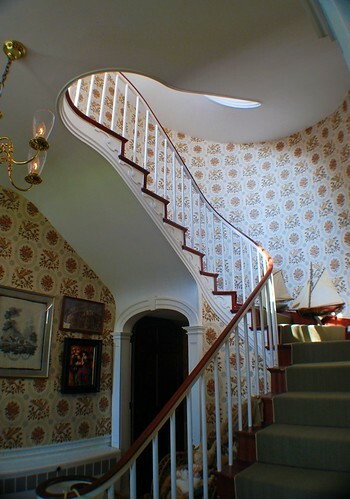 I really like the circular staircase, which I think was the name of one of the first novels my dad gave me to read (Mary Roberts Rhinehart ?). 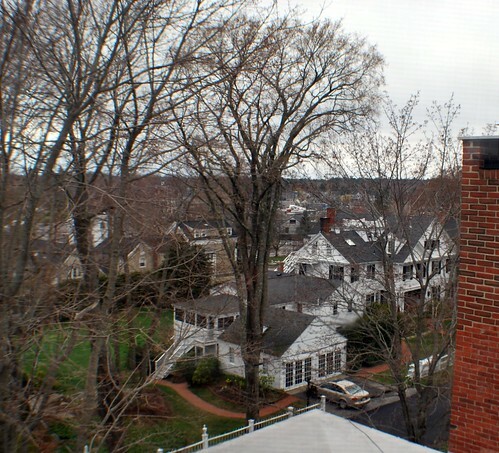 I can't imagine what the mansion will look like in the fall. You've got to put it on your calendar of "Must Do's!" Can't wait to visit the grounds with you.